The Let's Encrypt certificate is valid for 90 days. After 90 days, the certificate expires and the expired certificate needs to be regenerated and replaced. Easy HTTPs provides some options so that the certificate you apply can be automatically renewed or even automatically updated to your server. Easy HTTPs provides two ways to allow your certificate to automatically renew within 15 days of expiration. One is based on HTTP redirection configuration; the other is automatic verification based on DNS resolution (a detailed configuration method, please set the interface during the generation process). After you set up automatic configuration to verify your domain name, Easy HTTPs can be automatically renewed in the order within 15 days before the certificate expires. After the renewal, the system will send you an email notifying you to redeploy your certificate. 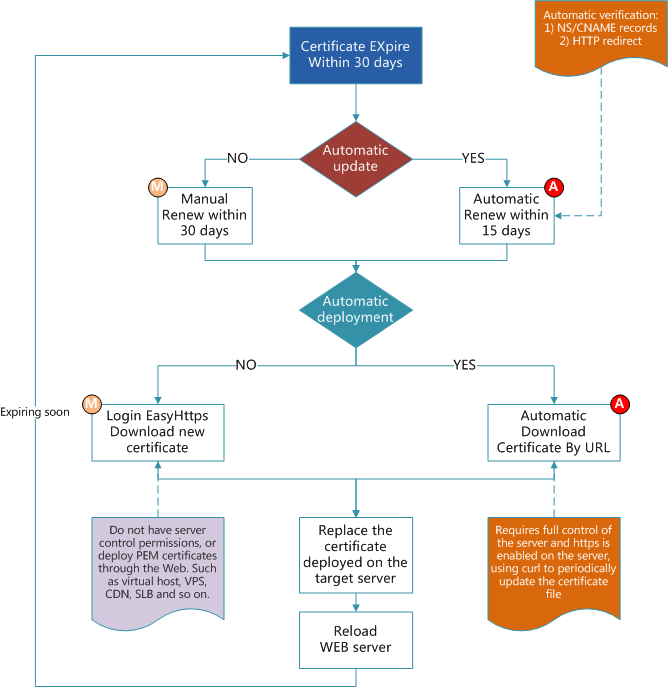 Manual update： Normally, after your certificate is renewed, you need to log in to Easy HTTPs to download the certificate again and replace your originally deployed certificate on your server (usually replacing only the .crt/.pfx/.jks file), and then reload your WEB server or mail server. If you deploy certificates (such as Alibaba Cloud, Hostgator, CDN, SLB, VPS, other virtual hosts, etc.) through the WEB console of a third-party platform, you must manually update the certificate every 90 days. Automatic update:Easy HTTPs provides an open certificate update URL for each certificate.Note that this method is only applicable to your certificate deployed on your fully controllable server.You can periodically access the certificate update URL through a URL request tool (such as curl). If your certificate is automatically renewed or manually renewed, it will be automatically synchronized to your server (usually writing a timing detection script, and then adding Go to the system planning task periodically.) At the same time, we provide automatic deployment scripts for Windows users and Linux users. You can obtain detailed information from the deployment help and download the automatic certificate synchronization software after the certificate is successfully generated. Easy HTTPs does not provide certificate deployment services. It only provides suggestions. The following figure shows a general process for reference only. Among them: Indicates automatic renewal and automatic deployment conditions and deployment. Indicates manual renewal and manual deployment.